The year was 1999. It was the first time I'd ever been to America, and the destination was Texas. One of the first things that struck me - other than the heat - was the variety of food I saw on offer. All kinds of things that were alien to me, including various sorts of Mexican food, barbecue, cheesesteak, chicken & biscuits, and something called "chicken fried steak". At which I immediately (and quite involuntarily) shouted "WHATTHEHELLISCHICKENFRIEDSTEAK?!" So... what the hell is it? First of all, it contains no chicken. 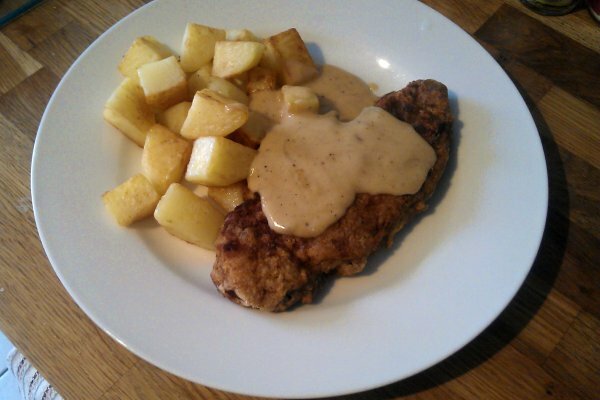 Rather, it is a steak fried in a spiced coating, similar in preparation to southern fried chicken. 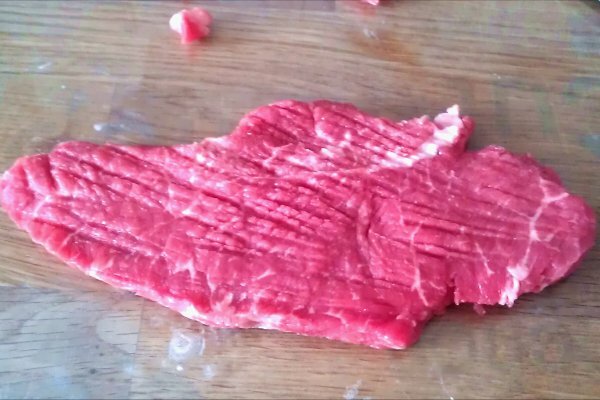 Usually you'd use a cheaper cut of beef like skirt or flank, but I had a piece of sirloin, which did the job just fine. I started by trimming the tough bits of fat and sinew, then bashing it mercilessly with the back of a knife to tenderise it and flatten it out. The dish just wouldn't work properly with a firm piece of meat. For the coating, I used a mixture of flour, cornflour, salt, pepper, and plenty of cayenne pepper. 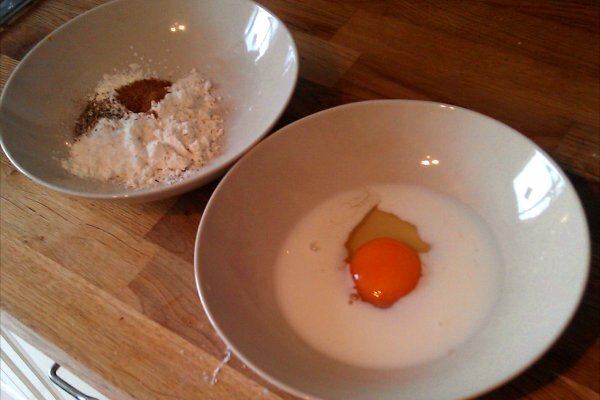 I dipped the steak into the seasoned flour, then into a mixture of beaten egg and milk. I then dipped it into the flour again. I then fried it - in quite a lot of oil - over a medium heat for four minutes on each side. The steak has to be cooked through, you really don't want any blood running out of the steak and into the coating. If you will only eat your steak bloody, this dish is basically not for you. The steak should come out with a nice crispy crust. 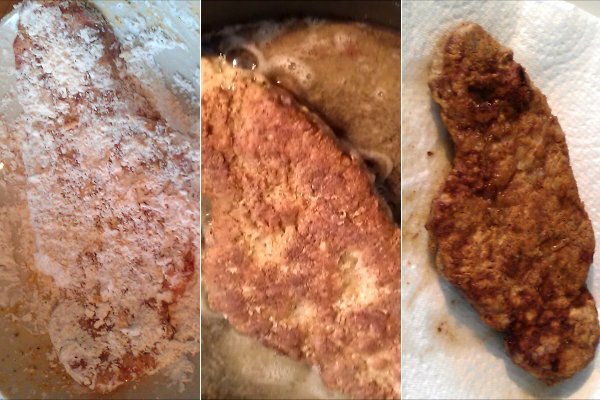 I should point out that in Texas you can see this dish either deep fried or pan fried, but honestly I don't think there's any point deep-frying a flat piece of steak. 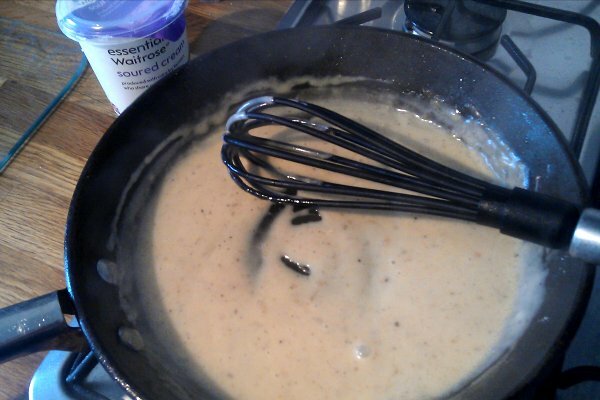 You have to be quick with the gravy, as the steak should be eaten as soon as possible. You'd usually eat this with mash, but I went for fried potatoes (or "home fries" as they tend to be called in the US of A). Now, tell me this doesn't look good. Go on, I dare you!